Once upon a time, in a life he’d rather forget, Terry Ambrose tracked down deadbeats for a living. He also hired big guys with tow trucks to steal cars—but only when negotiations failed. Those years of chasing deadbeats taught him many valuable life lessons such as—always keep your car in the garage. 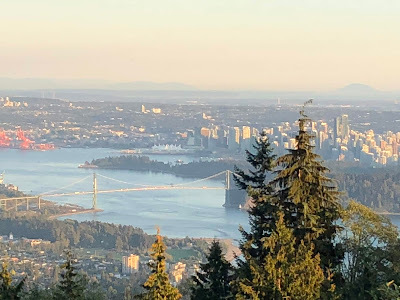 He now spends his time writing mysteries, including the Trouble in Paradise McKenna Mysteries, the Seaside Cove Bed & Breakfast Mysteries, and the License to Lie thriller series. Learn more about Terry and his books at his website. When I was a child, we had a family tradition of putting out a nativity set each year at Christmas. The set had been in our family for as long as I can remember. I have no idea where my parents bought it, but each year we diligently unpacked each piece, arranged the figurines, then repacked everything after the holidays. My mother and father moved to Santa Barbara in the 70s. They lived in the same two-bedroom apartment for more than thirty years. But when my father passed away in 2006, my mother knew the strokes she had suffered would make in impossible for her to live alone. And that meant we needed to move her. During the move we discovered how much stuff two people could accumulate over the course of thirty years. With the move approaching, we tackled the job of packing each item my mother intended to keep. It was a daunting job. Every item in the apartment, from clothing to art supplies to kitchen appliances had to be reviewed and categorized. We created multiple piles for donations, which I loaded into my car and took to a charity. There was another pile for throwaways—and believe me, there were plenty. And finally, the smallest pile of all included the items to be moved. The move from a two-bedroom apartment with about 1,200 square feet to a 400-square-foot studio was quite a shock for my mom, but she was an independent woman. She needed no assistance for walking, so walk she did, all over the streets of Santa Barbara. Although she had a great deal of space outside, she felt cramped in her little studio. But she had her possessions, including some of the family Christmas decorations, stored in boxes in her closet. It wasn’t until she passed in 2011, that we discovered the manger was still there. The figurines that went with the set, however, had apparently been lost during the move-in. After storing the manger in our garage for a couple of years, my wife and I decided we should find figurines to go with it. That turned out to be much harder than we’d expected! We searched for appropriately sized figurines and eventually found some that were only slightly larger than the originals. 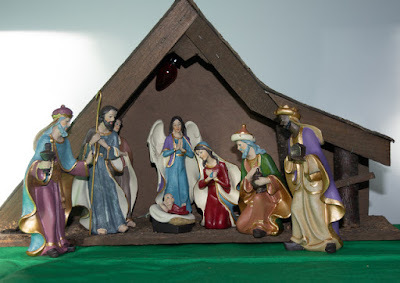 This Christmas, we’ll continue the tradition of setting up the manger and figurines just as we did when I was young. I wish we hadn’t lost the original figurines, but we still have the manger, and can still relish the joy of a family tradition. Neil S. Plakcy’s golden retriever mysteries have been inspired by his own goldens, Samwise, Brody and Griffin. Neil and his partner live in South Florida, where Neil is always writing, and Brody and Griffin are either sleeping or chewing one of their collection of dozens of plastic and rawhide bones. Learn more about Neil and his books at his website. Come the holidays it’s often a struggle to come up with the perfect gift for not only our nearest and dearest, but the maid, our kids’ teachers, the letter carrier, and others. 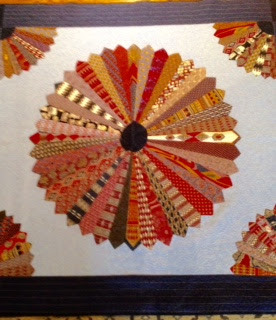 When I was a kid, my mother had contacts in the jewelry business in New York, so all my teachers got gold pins in the shape of a circle, which I’m sure went over better than perfume or scarves. It takes a lot of thought to go into the perfect gift—and it’s that much harder when your friends are fictional rather than real. But when you write a cozy mystery set at the holidays, like my Dog Have Mercy, there have to be gifts. Not only do they need to be relevant to the giver and the recipient, they also ought to have some larger resonance to the plot. A lot of work for a few words on the page, right? The protagonist for my (now) nine-book series is Steve Levitan, a forty-something guy who served a year in prison in California for computer hacking. He returned to his hometown, Stewart’s Crossing, Pennsylvania, with his tail between his legs, and he’s been trying to rebuild his life. His partner in crime (solving) is his golden retriever, Rochester. It’s pretty easy to come up with gifts for the dog—Steve gives Rochester ropes for tugging and bones for chewing, as I give to my two goldens. Steve also has a live-in love, photographer and college professor Liliana Weinstock. Since both of them are Jewish, their gift-giving takes place at Hanukkah. I admit, I was a spoiled only child. I got small gifts every night for eight nights—a book, a Toblerone bar, a box of my favorite cookies. I got my big gifts on Christmas day—bicycles, chemistry sets and so on. 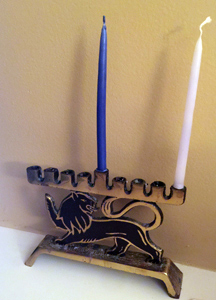 I decided that Steve and Lili would exchange their gifts on the first night of Hanukkah, as my partner and I do. Steve’s a computer guy, and around that time my partner had given me my first iPad. It seemed like a great gift for Lili to give Steve. I tried to make the gifts relevant to each character, and of course at the end to tie them back to Rochester, who believes he’s the star of the books. And no one’s going to tell him he’s not! 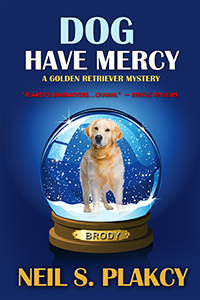 In the sixth golden retriever mystery, Dog Have Mercy, Christmas and Hanukkah approach and reformed hacker Steve Levitan tries to help a fellow ex-con now working at the vet’s office in Stewart’s Crossing. 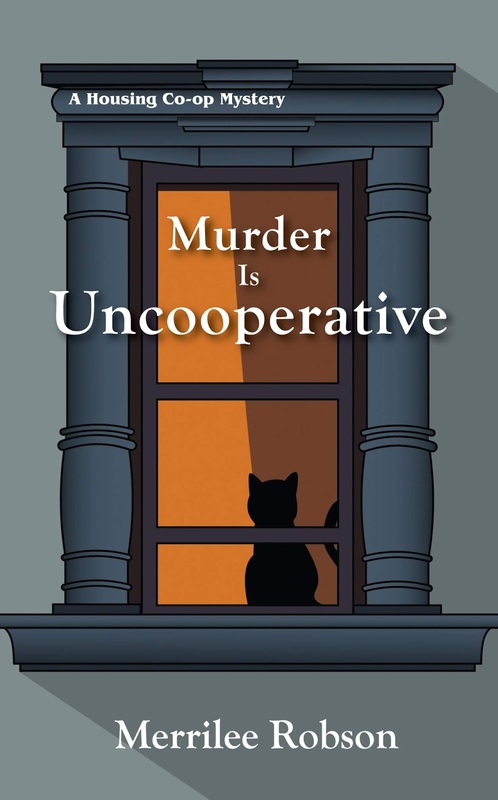 His curiosity, and the crime-solving instincts of his golden retriever, Rochester, kick in when liquid potassium ampoules are stolen from the vet and Steve’s new friend is a suspect. 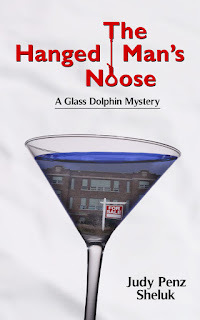 Judy Penz Sheluk is the Amazon international bestselling author of the Glass Dolphin Mysteries and the Marketville Mysteries. Her short stories appear in several collections. Learn more about her and her books at her website. 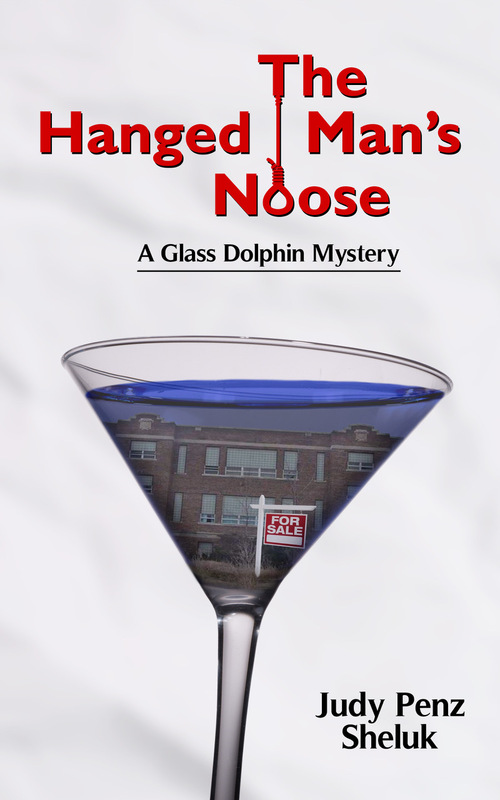 The Hanged Man’s Noose is the name of a local pub in Lount’s Landing, the setting for my Glass Dolphin Mystery series (The Hanged Man’s Noose; A Hole in One). Lount’s Landing is named after Samuel Lount, a real life Canadian politician who was hanged for treason in the eighteenth century. The pub’s owner, Betsy Ehrlich, is a local history buff. Along with their signature drink, the Treasontini, The Hanged Man’s Noose is known for their Full Noose Nachos, which according to the series’ main character Arabella Carpenter, are “to die for.” Definitely not diet food! You can also find a printable PDF copy of this recipe, as well as the Treasontini, on my website’s Food & Drink page. The Hanged Man’s Noose is available in trade paperback at all the usual suspects and in eBook format on Kindle, Kobo, Nook, Apple Books, and GooglePlay. Note: You’ll notice there are no amounts given for each ingredient. That’s because you decide how much or how little to use of each, depending on your taste and the number of people you plan to serve. 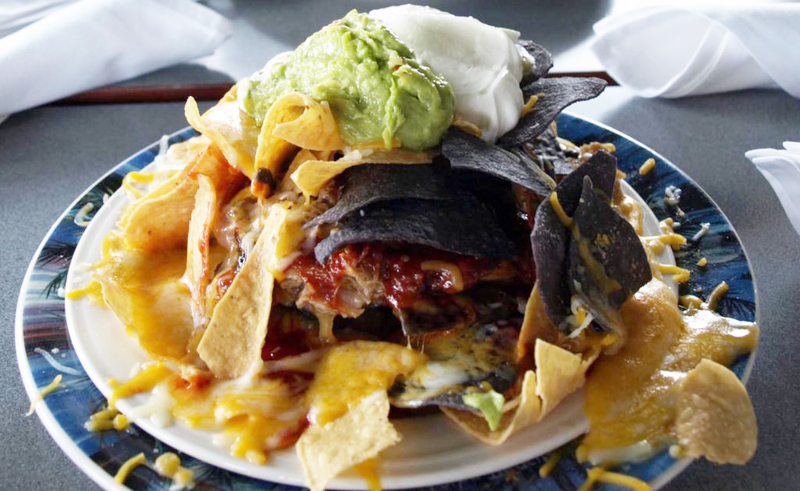 For a special holiday version, substitute red and green tortilla chips. Place a layer of tortilla chips on an oven safe pan or cookie sheet. Top tortilla chips with a sprinkling of each of the main ingredients, building layers of chips and ingredients as you would with lasagna, topping with the remaining cheese. Heat until cheese is melted. Remove from oven, place on plate, and top with guacamole and sour cream. Serve with salsa. Freelance writer Emily Garland is cash-strapped, newly single, and tired of reporting on the same old condo stats. When she’s offered a lucrative assignment in the village of Lount’s Landing, she decides to take a chance. All she has to do is relocate and uncover the real story behind a proposed redevelopment plan. What could possibly go wrong? Plenty, as it turns out. Not everyone is happy with real estate mogul Garrett Stonehaven’s plans to convert an old schoolhouse into a mega-box store. At the top of the list is Arabella Carpenter, the outspoken owner of The Glass Dolphin antiques shop, who will do just about anything to preserve the integrity of the town’s historic Main Street. But Arabella is not alone in her opposition. Before long, a vocal dissenter dies. A few days later, another body is discovered. Though both deaths are ruled accidental, Emily’s suspicions are aroused. 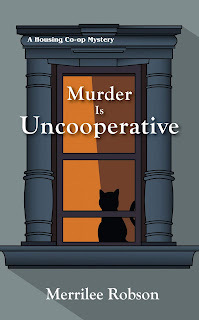 Putting her interview skills to the ultimate test, Emily teams up with Arabella to discover the truth behind Stonehaven’s latest scheme—before the murderer strikes again. Every few weeks during the last few months I’ve been showcasing craft projects for glass ball ornaments that are featured in Drop Dead Ornaments, the latest Anastasia Pollack Crafting Mystery. 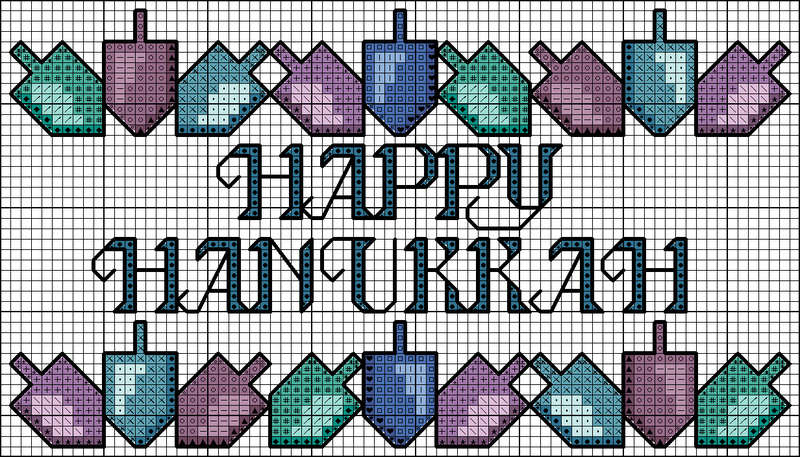 Today I offer you a cross stitch project perfect for another December holiday—Hanukkah, which this year begins next week. Hanukkah is the Festival of Lights. It’s an eight-day celebration that commemorates the rededication of the Second Temple of Jerusalem in the second century B.C. after the Jewish people, led by Judah Maccabee, rose up against their Syrian oppressors and drove them out of Jerusalem. According to legend, even though there was only enough oil to keep the temple’s menorah burning for one day, the candles continued to burn for eight days. 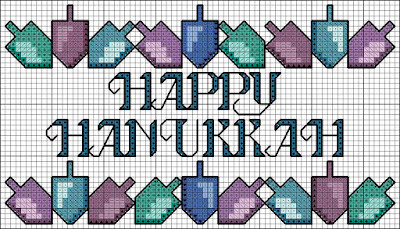 The cross stitch design features a dreidle border. The dreidle, a four-sided spinning top, is a traditional game played during Hanukkah. Cross stitch with two strands floss. Today we introduce our readers to debut cozy mystery author Jodi Rath. Learn more about Jodi and her books at her website and blog. I realized I wanted to be a writer at age five. I used to play “magazine owner” and take my mom’s old magazines and cut them up to create my own unique versions. By seven or eight I signed up at a local fair to win a set of encyclopedia’s and I won! I used to randomly pick a letter and open the encyclopedia to any page, read an article, and write a summary like I was a writer. I’ve always loved reading as far back as I can remember and loved being read to as well. High school was the first time I ever thought about writing an entire novel. After nearly fifteen years as a teacher, I felt deflated and depressed. 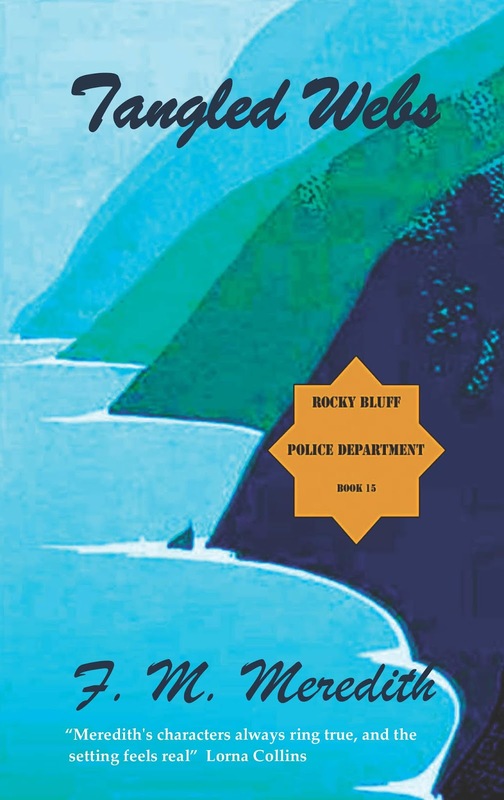 I began to write a mystery called Strange Blue. I could write twenty pages on everything that has happened since, but long story short, it has taken seven years to publish my first novel. Strange Blue should be available in late 2019. Mostly at home in my family room or on my screened in porch or when it’s cool enough out on my deck overlooking our woods. When I work in my family room, I have a staff of eight cats that tend to sleep a lot on the job! I generally have the TV on as background noise or listen to music. I listen to all kinds of music from 60’s to 80’s to metal to rock to indie to folk to jazz to classical. But I find that at certain parts of the writing process I need silence. My protagonist, Jolie Tucker, in the Cast Iron Skillet Mysteries is largely based on my quirks and my faults. Poor girl! Jolie’s best friend, Ava Martinez, is based on a combination of about four or five of my close friends. I love to research. So I research name banks online and play around with them. Sometimes I sketch my characters out, and that helps me get a more rounded feeling of them, making it easier to pick a name. Fictional villages based on a real village. The Cast Iron Mysteries Series is set in Leavensport, Ohio, a small wooded, farm village that is similar to my little village in Carroll, Ohio but with a lot of fictional places and details. Jolie’s Aunt Fern looks a lot like the Hallmark lady with big round glasses, curly gray hair, always wearing house dresses, and has a lot of dogs. Her ringer on her cell phone is “Who let the dog’s out?” and she has a tendency to flirt with a lot of the widowed men in the village, while constantly embarrassing her niece. I’m an eccentric chic. I’ve always been a weirdo, nerdish type. I mean, a five year old playing out a fantasy for a few years (did I mention it was years) of owning a magazine and using her stuffed animals and dolls as her staff…that child is destined to be a peculiar adult. When my mom took me to the zoo, I used to say I wanted to tame the big cats, and here I am today, writing with the big cats. Three of my boys weigh in at 18, 17, and 26 pounds respectively. Not to mention I’m a horrible singer and dancer, yet I sing and dance for my cats and my husband a lot…like an uncomfortable amount of bad singing and dancing. Quirky enough for you? I can go on! Any Agatha Christie, Hunter S. Thompson, Sara Paretsky, or Ernest Hemingway book. 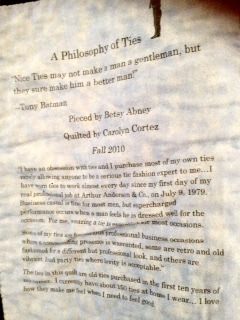 I was a literature major in college and could make you a three-page list. I am thankful for all the good and bad things in my life. Each taught me something important about what to do and what not to do and helped me make decisions on paths in my life. I am extremely happy with where I am right now. I don’t think I’d be here unless every single thing happened as it did, so I wouldn’t do anything differently. Lack of tolerance. I taught high school English and I always tried to incorporate into my lessons that it’s okay to agree to disagree and to be different. Tolerance is key to peace and communication. My laptop and a way to charge it (does that count as two? ), my cats, my husband. Working in sales or in fast food. Everyone wants me to work with people and that stresses me out, but I’m told I work well with people! LOL...I know, how could I teach all those years? If I have to pick only one, J.D. Salinger’s Franny and Zooey. Just started my business in February of 2018, so I’ll continue to offer my online courses for teachers and educational writing. I have fourteen titles and sketches for the Cast Iron Mystery Series, so I’ll be working on those for years to come! 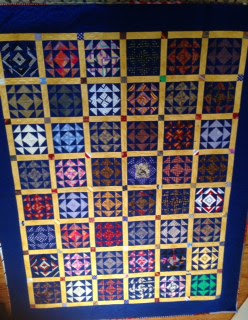 Plus I have so many projects on the back burner. I get bored easily and switch from project to project. I see that you have a food editor, Cloris! Cloris may appreciate that the Cast Iron Skillet Mysteries will feature a “secret” recipe at the end of each book with a cast iron skillet tip as well. My grandma gave me the seventy-year-old cast iron skillet she received as a wedding gift. She has only ever made pineapple upside down cake in it because that was my grandpa’s favorite dessert. I now have a lot of cast iron skillets, and I can’t believe I ever cooked without them. I posted pix and the story about my grandma on social media and so many people shared recipes and comments and it was so amazing that they made me want to write this series. 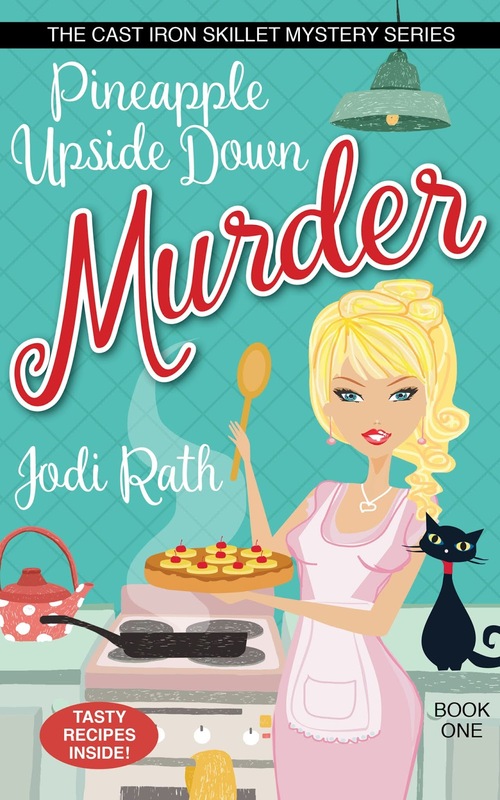 Introducing Jolie Tucker, an introverted yet passionate restaurant co-owner of Cast Iron Creations, who, at her best friend Ava’s request, steps out of her comfort zone, which leads her into the shade of a killer in the small, cozy village of Leavensport, Ohio. The victim is the village’s beloved Ellie Siler who runs the village sweet spot, Chocolate Capers. Jolie finds her grandma Opal is a prime suspect and goes on a search for answer only to find out that her family’s secret recipes may not belong to the Tucker family at all. Jolie’s job, family, and livelihood are all on the line. The answers are assuredly lethal. Through the white and drifted snow, O! Oh hear the bells ring, "Ting-a-ling-ling!" Hurrah for Thanksgiving Day, Hey! Spring over the ground, like a hunting hound! For this is Thanksgiving Day, Hey! We seem to go extremely slow. Award-winning and bestselling author Vicki Batman recently stopped by to share her grandmother's recipe for fruitcake made with tomato soup. Today she’s here to talk about the quilts made from her husband’s tie collection. Vicki has written numerous romantic comedies and two humorous romantic mysteries. She describes herself as an avid Jazzerciser, handbag lover, Mahjong player, Yoga practitioner, movie fan, book devourer, chocaholic, and Best Mom ever. Most days begin with her hands set to the keyboard and thinking, "What if?" Learn more about her and her stories at her website/blog. I grew up when working men wore suits to their job and to church, to shows, etc. I like the look. Handsome’s career began at a large accounting firm and he wore the “uniform”, too. 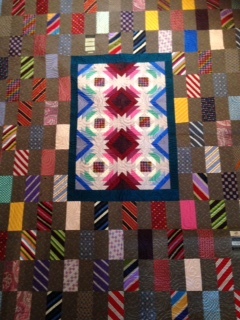 He especially liked ties and for a long time, never threw any away. Creativity abounds in the holiday anthology, the Whispers of Winter, featuring my romantic comedy short story, “The Great Fruitcake Bake-off”. 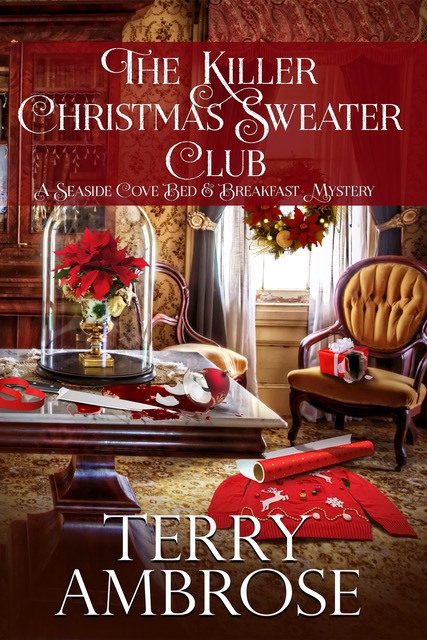 When five-time champion Samantha Greene teams up with her new neighbor, Dixon Roberts, for The Great Fruitcake Bake-off, they discover baking a prize-winning entry is complicated, bad guys are plotting to take the crown, and first prize isn't just about a ribbon. Blink, and the holidays will be upon us. Hard to believe, isn’t it? From now through the end of the year we’ll be periodically featuring authors of holiday mysteries who will talk about their favorite holiday memories and traditions and even a favorite holiday ornament or two. First up is Christine Desmet, author of the Fudge Shop Mystery Series and the Mischief in Moonstone Novella Series, to talk about a wonderful childhood tradition from her days growing up on a farm in the Midwest. Christine is also a screenwriter, as well as a writing instructor at the University of Wisconsin-Madison Continuing Studies program. Learn more about her and her books at her website. When I was growing up, the holiday season meant an odd array of tastes and smells mashed together. There was always homemade vanilla ice cream made with ice chipped from the cow’s watering tank, pickled herring for Dad, oyster stew for Mom (which she made herself), and when I got old enough (around age 14)—a “hot toddy.” The latter was made of hot eggnog with a splash of brandy from a small bottle my parents kept hidden. I grew up on a southern Wisconsin dairy farm in a family of five kids. My siblings were all younger than I was but close enough in age that we could play and work together. We didn’t have much in the way of fancy food or fancy anything. It was a thrill on the last Saturday catechism before the Christmas holiday to get a small sack with an orange in it. Sometimes Santa would leave an orange in our stockings at home, too. Stockings were pinned to the arms of our red sofa because we didn’t have a fireplace. One of our best holiday traditions was making homemade ice cream. We loved it, but boy was it work. My mom expected us to work for it, too. If we wanted ice cream, we had to take an axe and chip away at the ice that had formed in the watering tank for our herd of Holsteins. We lived six miles from our small town, and even if we wanted to buy ice back then you wouldn’t have found it in the little grocery’s freezers. Besides, what farmer would be silly enough to waste money on ice when you had it just outside the door in the cow tank! My brothers are all younger than I am, but by the ages of 10 or 12, they were strong and had been driving tractors and stacking bales and such for about four years. They’d get the axe or hatchet and away they’d go to the frozen tank and chip away for a half hour or more to get a couple of buckets of ice. I would sometimes help collect the chips and put them in pails. We never thought about the danger of a kid wailing away with an axe. We were taught early how to be careful on the farm (though accidents did happen). For Mom, this activity of making ice cream was a great way to get us five kids out of her hair, as she’d say. The house smelled heavenly of bread baking by the time we hauled in the ice and got the ice cream maker up from the basement. One of us would go out through the cold and snow and retrieve a gallon or two of fresh creamy milk from our bulk tank in the milk house connected to the barn. Mom dumped the milk, sugar, several egg yolks and vanilla extract into the stainless steel cylinder. Then it was time to turn the crank by hand. (There was no such thing as an electric churn in those days.) This was torture because it felt like the cranking went on for an hour (which it may have) and our arms would fall off. As the ingredients turned into ice cream, the cranking became harder and harder. We would switch off regularly. And sometimes argue about whose turn it was. We also had to keep adding ice chips and sprinkle salt on top of them to keep the scientific process of ice cream moving forward. It always amazed us that “melting” the ice created “frozen ice cream.” Mom would take the lid off the top of the steel drum now and then and declare, “Too soupy. Keep cranking!” We groaned. After our “arms fell off,” we had ice cream. We were so eager for the tasty reward that when it was dished out in cereal bowls we’d eat it too fast. Talk about a headache! We never learned. Every time we made homemade vanilla ice cream, we knew we were in for a headache. But it was worth it. Ice cream made that way during a holiday time is something special, a wonderful way for a family to enjoy being together. 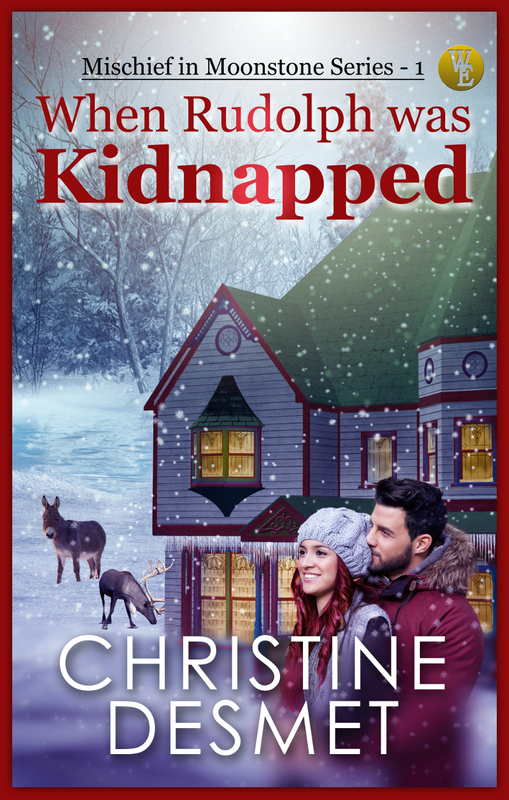 When her pet reindeer, Rudolph, is stolen from the live animal holiday display, first-grade teacher Crystal Hagan has a big problem on her hands. Her students fear that Christmas will be canceled. Ironically, the prime suspect is a man who lives in a mansion known as the "North Pole". And to her shock, Peter LeBarron admits to kidnapping Rudolph and he won’t give him back without some romantic "negotiations".